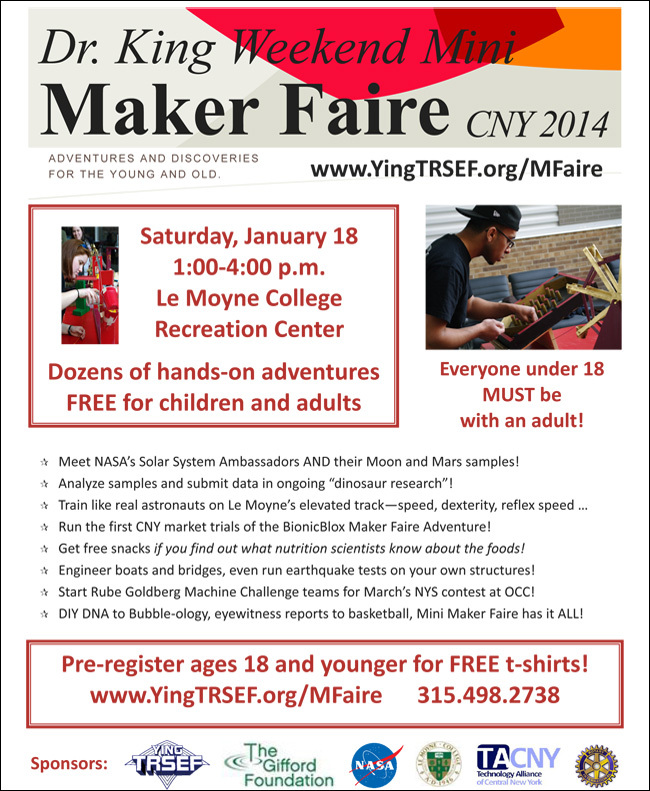 Ying-TRSEF Mini Maker Faire – Adventures And Discoveries For The Young And Old – 18 January 2014, 1 – 4 p.m.
We are now one week away from a Mini Maker Faire being hosted by Le Moyne College and featuring, among many other great activities for young and old alike, CNYO members Ryan Goodson and myself in our new capacities as NASA Solar System Ambassadors (in our case, running a booth on the Solar System – quite appropriate!). The event, organized by the always-energetic Mary Eileen Wood, Director of STEM Initiatives at OCC (if you’ve ever judged at a local science fair, chances are you know who I’m talking about), and sponsored by YING-TRSEF, NASA, The Gifford Foundation, TACNY, and several other local institutions and companies, is an afternoon-long event of science demos, hands-on projects, engineering studies, even astronaut training – all free and open to the public (although those under 18 MUST be accompanied by an adult!). Information about the event can be found at its website: www.yingtrsef.org/MFaire/. What? Maker Faires are about hands-on experiences, supported by people who really love science, engineering and the arts. When? Saturday, Jan 18, 1:00-4:00 p.m.
And … It’s free to everyone! Pre-registered youth and volunteers even get FREE NASA t-shirts! There will be a few space-centric booths at this Faire, with our Solar System booth getting a little extra tweaking in the form of multimedia and a few (very small) Mars and Moon rocks in attendance. We are looking forward to an afternoon of teaching and getting our hands dirty with some of the other demos running near our booth. If you’re interested in attending, please consider registering early. If you’ve interest in helping with the CNYO Solar system demo booth, just let me know!